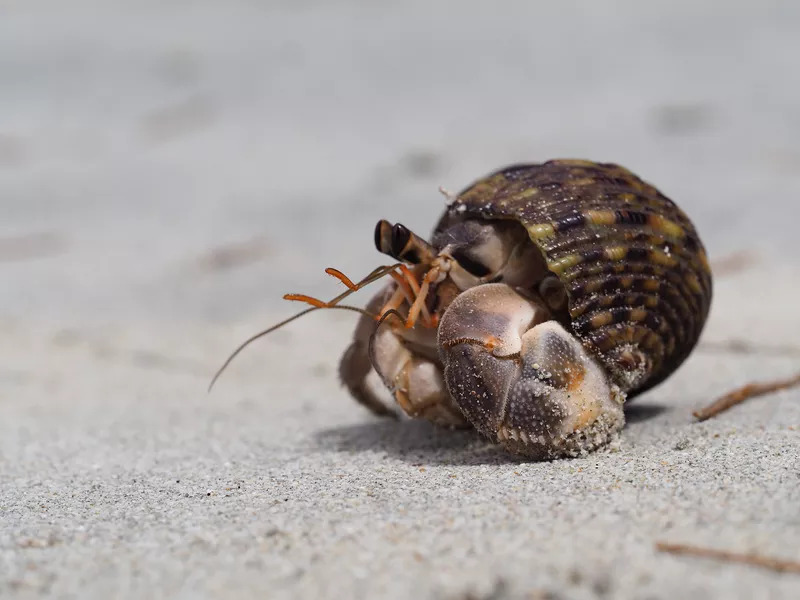 What are hermit crabs favorite protein sources? I am going to place a large order of supplies soon, and I am going to include some kind of bug or something, maybe two. Jamison wrote: What are hermit crabs favorite protein sources? I am going to place a large order of supplies soon, and I am going to include some kind of bug or something, maybe two. Crickets, blood worms...really anything. And all crabs are different. And even if they like something one time, they may not touch it the next time. But they do like variety. Mine go crazy for Beef Lung, and Beef Tripe (stomach). They are two that usually disappear quickly. ooooo Motorcrab you are adventurous!! I have been a vegetarian for 30+ years, and so am rather...what's the word...cautious? boring? basic? when it comes to the meat products I offer my crabs! Where the heck do you get that kind of stuff? curlysister wrote: ooooo Motorcrab you are adventurous!! I have been a vegetarian for 30+ years, and so am rather...what's the word...cautious? boring? basic? when it comes to the meat products I offer my crabs! Where the heck do you get that kind of stuff? But really IIRC they work with effects and stuff and haunted houses and things so may just come across offal in their line of work. LOL, that could be! I was also thinking that maybe if you asked a small town butcher to save some of that stuff for you, they likely would. I think as someone who doesn't eat meat, I will stick to the 'basic' meats tho! Hahaha! I am too Curlysister - I'm on my 25th year now of being a borderline vegan. I might have introduced those things to him - I sell them in my store. I gotta feed my crabs! I try to find really interesting things for them, and I like to mix up proteins for them. My crabs favorite though - crab - then beef lung. My wife and I are both vegan actually believe it or not. I have been for around two years, xenocrab for 7 or 8. It's hard enough for us to plan a balanced diet in our area because vegan options are far and few at grocery stores unless we make it ourselves. Our hermit crab seitan roast for Christmas was vegan and made from scratch. Going out to any restaurant pretty much limits us to a salad most of the time. Some places are slowly getting at least one meal at least. Yes Stacy is the the one that introduced me to those foods. 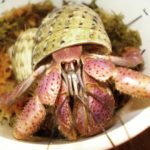 I don't even want to begin trying to figure out how to make a hermit crab strictly plant based, it would eliminate just about all calciums, sealife, and of course meats. I'm sure it could be done with extensive research but I know I don't have that much time to deal with that. I don't want them to suffer deficiencies due to not giving them a balanced diet due to not offering items they may encounter in the wild. I'm sure they would not find beef, or chicken in the wild but may come across a dead rat, snake, or other natural wildlife similar to what we feed them. For what we feed them even though it is against our ethical beliefs we don't really have a solid alternative. I guess the haunted house work I do does help some. Although I have been getting away from the gore and shock aspect and leaning more toward psychological with confined spaces and not seeing what is ahead of you. But then again when it is deer season here you end us seeing tons on carcasses strapped to car roofs, and trucks. Motörcrab wrote: My wife and I are both vegan actually believe it or not. I have been for around two years, xenocrab for 7 or 8. It's hard enough for us to plan a balanced diet in our area because vegan options are far and few at grocery stores unless we make it ourselves. Our hermit crab seitan roast for Christmas was vegan and made from scratch. Going out to any restaurant pretty much limits us to a salad most of the time. Some places are slowly getting at least one meal at least. One of my partners has been vegan for years and years, and is also teaches ethics for a living, like thesis away from doctorate level, and she believes that it would be unethical to force any animal that requires meat or protein in their diet to be fed a vegan diet. It can be considered animal abuse in some cases. The first line of my comment was a Misfits reference and I remembered that some haunted houses used to use or may still use leftovers from animal processing facilities as props. The Misfits reference went right over my head! Not sure how I missed that one. The one guy I used to work with gave me last years cow skulls from when he would butcher. I ended up using them as props outside of my barn on a fence at the haunted house. I thought about that decision for a long time before I decided to get them and use it for that. It may not be the "ethical" vegan thing to do but they made an awesome prop. There are also stories about old western outlaws that were were mummified and were paraded around to see. Rumor is one was used for years in a fun house and was eventually discovered by a film crew in the late 70's or early 80's. I guess it's no different than going to Ripley's in Wisconsin Dells and seeing the head of Peter Kurtin today. Any type of vegan/meat, political and religious topics almost always escalate quickly and are usually best kept at minimum in forums. Too many people are right and everyone else is wrong. That’s why we don’t allow the religious/political discussions here. I don’t recall any vegan flame wars or anything but boy did the eco earth vs. mix of ee and playsand battle of the mid 2000’s go hard. Some people never reconciled. I wasn’t here for it but I read the archives. No, we had a vegan flame war years ago! I think we've seen just about all of the major forum no-nos at some point. Religion and politics are the only two things I can think of that the HCA has always slammed shut immediately, and they don't have a thing to do with hermits, so I can understand why the founders wanted to stay far away from them. I'm always of the opinion that if the discussion us about something that relates to hermits and it stays on moderate ground with no personal attacks then it's worth having. Veganism and having pets that must be omnivores or carnivores is a conversation that is important! Sometimes there are ways to make all parties feel better going forward.